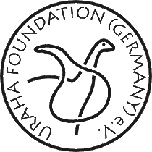 A Rhinoceros for Karonga – URAHA Foundation Germany e.V. On the 22nd June 2016 the Cultural & Museum Center Karonga (CMCK) celebrated the arrival of a new exhibit: the mounted skeleton of a female Black Rhinoceros called Chimwemwe (in the local language Chichewa) which means JOY. The Rhinoceros had been sent in October 2000 from the Kruger National Park in South Africa to the Liwonde National Park in Malawi as part of the third rhinoceros pair for resettlement. But the resettlement for Chimwemwe was so traumatic that she died after just three months, shortly after she was released from the boma into the fenced reserve. When the body was found it was already decayed so it was not possible to find out the cause of death. As her horns were still there pouching was unlikely to be the reason. 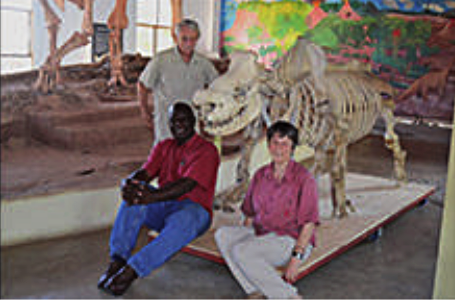 Her bones were collected in September 2002 by Prof Dr Friedemann Schrenk and Mike Labuschagne the manager of the Liwonde Park. The bones and the teeth showed that she was young, between 8 – 9 years old (because the last molar M3 had not yet erupted), and she also was in the early stages of her first pregnancy. First of all the bones were used as study material for students at the Palaeontological Excavation site of the Malema Camp to the south of Karonga. So it was considered that these bones could enhance the display in the CMCK. In August 2009 Prof Schrenk invited to Karonga Eric Milsom Fossil Conservator from the Hessian State Museum Darmstadt (Hessisches Landesmuseum Darmstadt) and his wife Bettina Henrich Zoological Taxidermist from the Natural History Museum Mainz (Naturhistorisches Museum Mainz), who are both Uraha Foundation members. The object of this visit was to investigate the condition and the completeness of the specimen: it was found that the bones were naturally preserved and fully cleaned by natural decay and in good condition and that the specimen was nearly complete. So a plan was made to mount the skeleton for the museum. This plan was put into action in May and June 2016, which took Eric and Bettina 5 weeks to complete. All the work was conducted at the house of Prof Schrenk in Karonga Old Town where they were well catered for by the caretaker/cook Christopher Sikazwe. After cleaning with detergents and water, which took about three days, the bones were allowed to dry, after this the bones were ready for mounting. First the pelvis and the vertebra column were fixed together on a supportive metal tube running through the neural canal. The tube could be drilled (for inserting a fixing metal wire) and bent as needed. The bones were secured together on it with a two component polyester resin adhesive, as were the ribs attached later. This adhesive and metal rods served also to fit the leg bones together. The foot bones were put together with hot wax. Eight foot bones were missing so these were carved in wood by the wood carver James Phiri and they were then inserted in the feet of the skeleton in their respective positions, this also helped in stabilizing the feet. 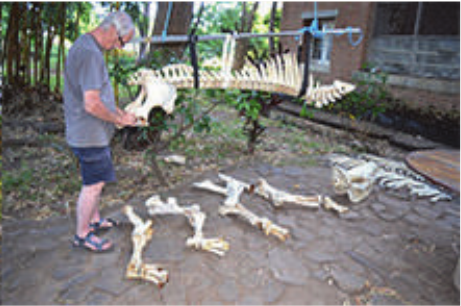 The metal armature on which the skeleton was mounted was welded together by Mathews Mkambala & Tasohwa Tomosa from the Mdoka Welding Shop in Karonga. Wheels were fitted to the base of the mount to make mobility easier. The carpenter Kingston Silachi made the wooden base plate to fit the metal base frame. With the skeleton now finished, a lorry came and brought the skeleton to the museum (Slowly and very carefully) under the view of many amazed local spectators in the town. Now in the museum it offers as a mammalian skeleton an interesting comparison to the Malawisaurus (which is a reptile) and also adds another new dimension to the museums display.